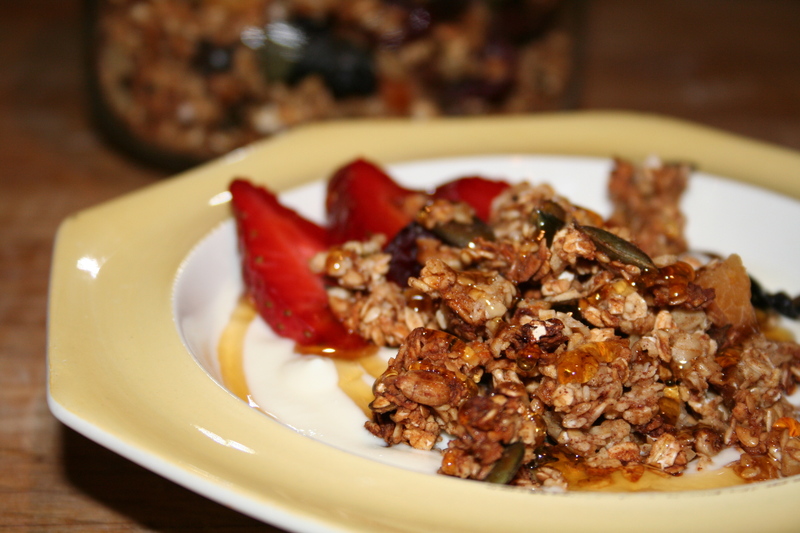 Granola – the perfect breakfast cereal of champions or ordinary mortals! As ever I have turned to my recipe book of choice. Nigella’s Feast has a fabulous breakfast section and I have tried most of the recipes. The recipe for Granola is not her own, she got it on one of her trips to the USA. This recipe is called Andy’s Fairfield Granola and was gleaned from a deli called The Pantry in Fairfield, Conneticut. As always I have tweaked a bit but as Nigella was so enthused by this recipe I will show the original recipe “with nuts” and my modified “no nuts” version. For both sets of ingredients the method remains the same. This granola is definitely one to add to your repertoire and I think benefits from some personalisation. Quite frankly if you are going to go to the trouble of making yourself home-made breakfast cereal it might as well include all of your favourite things. I replace the nuts for extra seeds. I often add an extra teaspoon of cinnamon as I love it. I punched up the ginger last time too which was yummy. Sugar content is pretty high for this one and I have reduced the brown sugar by half and the golden syrup by a third without it causing too much trouble. If you do reduce the “wet” sugars be aware that this will make the mixing harder and you will have a drier granola. You could add a little extra oil though if needs be. 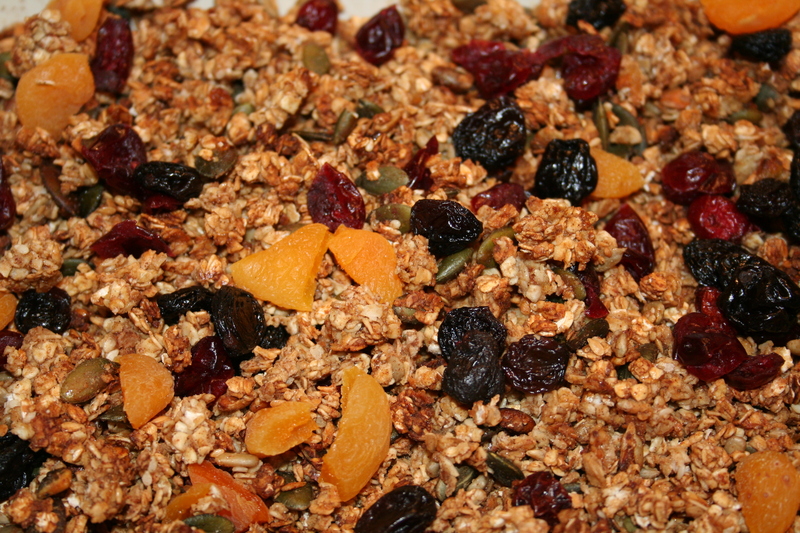 Most dried fruits work really well with the granola, use whatever rocks your world. Mix everything together except the raisins/dried fruits. Nigella recommends using two spatulas as this is a really sticky mixture. I have bought the disposable gloves you can get easily from the supermarket and just got stuck in with my hands. I find it easier to tell if everything has been mixed this way. Spread the mixture evenly into two baking tins, large roasting size is about right. Bake your granola in your oven at gas mark 3/170 degrees C for about 40 minutes. You will need to turn and stir your granola on occasion throughout the baking time to ensure you get a good even golden bake across the granola. Once baked, leave to cool, add your raisins or other dried fruits, store in an airtight container. I tend to serve this with vanilla yoghurt, strawberries or seasonal berries. So yummy and almost virtuously good for you.